Each year the Society publishes a highly informative full colour Journal which covers not only the activities of the previous 12 months but also includes many illustrations of new and unusual caddy spoons acquired by members. There are interviews with designers, profiles of members and a variety of articles about collecting. This quality full colour publication is sent free to every member. Please note: this publication is NOT available to non-Members. A project to transfer all back copies of the Journal to digital format is making good progress. Members will be able to purchase issues dating back to the start of publication (as the Society Newsletter) more than 50 years ago. Over the years these publications offer an invaluable resource and repository of knowledge. New and established collectors and researchers alike find them of great practical help. Again, this facility is available to fully paid-up Members ONLY. Members meet regularly at social events, where we share friendship, enthusiasm and information about spoons acquired. Photographs and detailed descriptions of spoons brought to the meetings are included in the Journal, for all Members to see. The committee organises at least two outings for members each year. In the past these visits have included Assay Offices, curated tours of famous museum collections and exhibitions by modern silversmiths. Sometimes the venue allows the opportunity for members to bring along and display new acquisitions. The Society also holds an annual lunch, attended on occasions by overseas members. We try to ensure ease of access to venues, and menu preferences are of course taken into account. By arrangement with the Hon Social Secretary, Members may bring invited guests to our events. The Purchase Scheme is another EXCLUSIVE service, one of the most beneficial aspects of Membership. Members can buy and sell their spoons through the Society, for a nominal fee and in full confidence. Values and accurate descriptions of spoons for sale are agreed in advance with the Purchase Scheme Secretary, and photographs taken. Spoons may then be advertised on the pages of this website, without charge. Spoons for sale, together with prices, can be seen by anyone visiting the site. However, only Members will then have an opportunity to buy, on a first-come first-served basis. A small administration fee is paid to the Society. This is a simple and convenient way of refining and updating collections, without paying hefty auction fees or dealing on-line with 'persons unknown'. For example, auctioneers charge a fee to both buyer and seller, which can add up to 40% - 50% or even more of the item's hammer price. Both parties pay these fees, which add to the cost of collecting and reduce the realised value of Members' spoons. Instead, the Society charges a fixed fee, not a percentage, to cover admin costs. Surpluses go into the Society's funds, to keep costs to Members down. The Society is rightly regarded as a centre of specialist knowledge. One of its founder members was John Norrie, who wrote the definitive reference book on caddy spoons. From the outset, the founders stated that the Society "did not seek to be profound." But sharing knowledge, and increasing our expertise, is important. Currently about 15 per cent of members communicate with each other as part of an informal research group. In addition, a complete Index of Contents of the Newsletter (now the Journal) dating from 1963 is available to all members. The Index lists makers, contributors, lectures, features and book reviews and is proving an invaluable research tool. 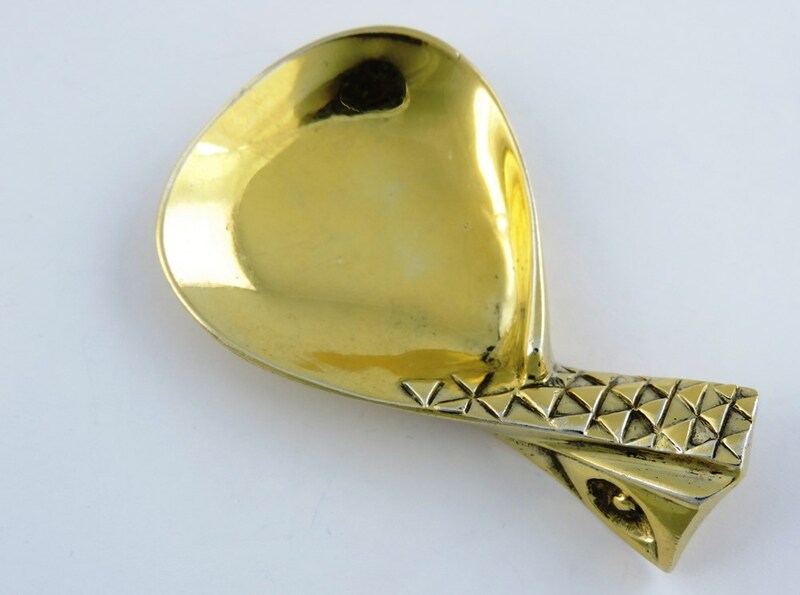 To mark its Exhibition of 609 spoons at the N.E.C Birmingham, Antiques Fair in 2015 the Society published "The Story of the Caddy Spoon 1775 to 2015". This 100 page catalogue is now on sale via this Website, at a cost of £15 plus postage and packing. If you would like a copy please contact us via the enquiry facility on this site. Limited numbers of another Society publication, "The Caddy Spoon in the 20th Century" are also still available, 36 pages of A5 size with 155 full colour illustrations. From time to time the Society commissions spoons from leading designers which may be purchased exclusively by members. Silversmiths who have designed spoons for us include Gerald Benney and Malcolm Appleby. Over the years, these have appreciated significantly. Joining the Society allows you to keep abreast of what young designers are creating in this specialised field. Their work is featured in the Journal and news bulletins sent out when events of interest take place. A competition for young craftsmen to design a caddy spoon was inaugurated in 2017, and attracted entries from sixteen eligible designers. After due consideration by the Committee, the winner was chosen, by a unanimous decision, as Loucinda Nims. All members were then given the opportunity to order this spoon, which was made in limited numbers, to order. Finally, members may purchase a Silver tie or lapel pin.This is a miniature of the Society's emblem - the famous ‘Eagle’s Wing’ caddy spoon. The die for these items is still held on behalf of the Society and more can be produced – again, exclusively for members. As well as the annual Journal, the Committee also sends out regular bulletins, detailing Society activities, forthcoming meetings, news of new designers and other items of interest. These are available by email only so do not add to our costs. The website continues to serve its original purpose in generating interest in our hobby and attracting new members. It will be updated with Society news and the Gallery display of spoons changed to ensure continuing interest. If we have been successful in attracting new members, we hope to be able to extend the site, and to include a ‘members only’ section. Please do continue to visit the site – Bookmark it, add it to your Favourites list and maybe even diary it for a regular check! Whether you are an established collector or new to the field, we very much look forward to hearing from you – use the Contact Us button to email us - in complete privacy - for more details about membership.